Panettone is a type of bread loaf originally from Milan and usually prepared and enjoyed for Christmas and New Years. You can add whatever types of dried fruits and/or nuts you choose. This bread is fantastic toasted and buttered or think French toast! It is not like the super sweet cake-like panetonne’s that you buy at the stores. It is more like a bread. Please give it a try–awesome! 1. Add water, yeast sugar, eggs, sour cream, vanilla, lemon zest, salt and flour. Mix well. Stirring in flour a little at a time until dough forms into a manageable ball. Turn out onto a lightly floured surface and knead for 5 to 10 minutes, adding a little flour as necessary, until dough is soft and pliable. I did this whole process with my stand mixer with dough hook. Place dough in a large, lightly greased bowl, cover, and let rise in a warm place until doubled, about 1 hour or you can do this whole process on a bread machines dough setting adding fruit at the beep. 2. Preheat oven to 350 degrees. Line a round 9-inch springform pan with parchment paper. Make sure the parchment paper goes up the sides. Punch down dough in bowl, transfer to floured surface, and knead in the raisins, cranberries and pecans. 3. Place dough in prepared cake pan, cover loosely with dishtowel, and let rise 30 minutes to 1 hour. Bake for 45 minutes (1 large pan), 35 minutes (2 smaller pans) or until loaf is golden brown and a toothpick inserted in the center comes out clean. Check halfway through and if necessary tent with foil also. Bakers notes added: Divide the dough and make two. I found this to be best. *I have made this recipe in my bread machine on the “dough” setting adding the fruit and nuts later at the beep. It rises perfectly! Then all you have to do is divide and place in 2 pans to rise one more hour and bake as above. Actually I prefer this method. 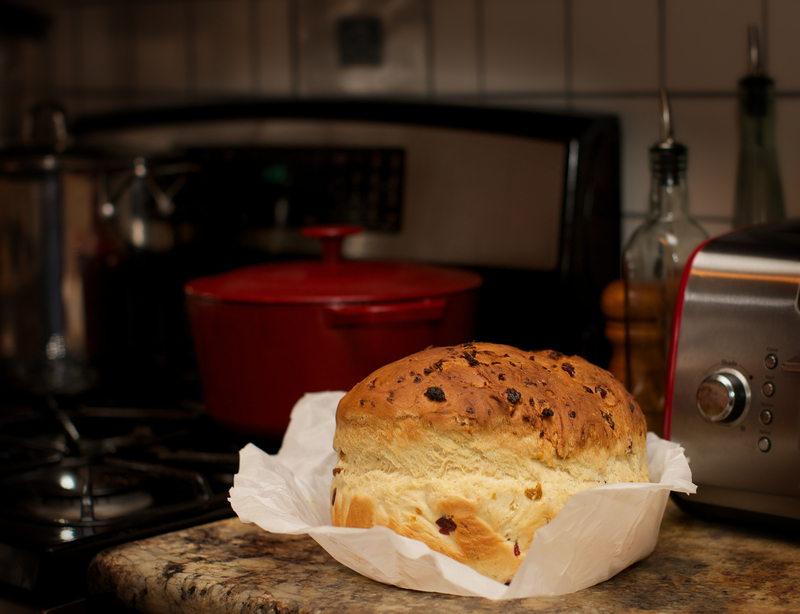 This entry was posted in Uncategorized and tagged Christmas bread, panettone. Bookmark the permalink. That looks so good, does it have to sit for a while like the German Stollen? Not in my house Ingrid. LOL! !